Mimi's Audio & Video | > Projector Installation > Mimi’s Provides the Best Screen and Projector Installation! Mimi’s Provides the Best Screen and Projector Installation! Deciding to hire a professional video service to install a new or existing flat screen T.V. or projector depends on how complex the job is and how confident you are with your DIY skills. 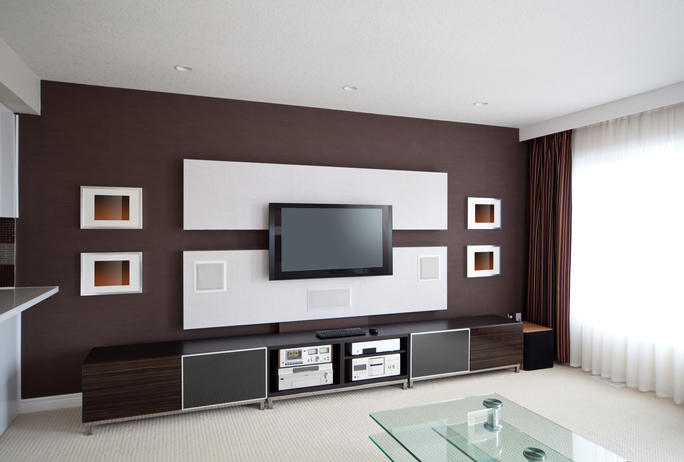 If your television or projector is sitting on a stand or within an entertainment center, you may not need help from a professional to install them. However, if you choose to mount a flat panel television on a wall and running the wiring within it, you may want to consider bringing in an expert (if you don’t have expertise in this sort of thing). Even if you’re confident you can mount a flat panel television to the wall on your own, you should consider the cables as well. A mounted TV with one or more cables hanging from it isn’t visually pleasing. Therefore, if you think you want to hide the cables in the wall, do you have the skills required to start drilling and running cables without demolishing that section? There’s also the option of using a cable concealer cover which can be sized to the length and width of the cables being connected. However, if your wall isn’t white or beige, you’ll probably want to paint the concealer to match the same color. Do you really want to go through all that extra hassle? It seems like your mounting project is becoming more and more complicated, doesn’t it? Here’s something else to consider before buying a new flat screen T.V. Be sure to measure the distance from where the T.V. will be mounted/placed to how many feet it will be away from your furthest seat. This action will help to determine if the size screen you’re purchasing will provide optimal viewing. Plus, it won’t make you regret buying a screen that’s too small or too large. Projector system installation for your home or business can also be a complicated project. As with a flat panel installation, there are a few things to consider when it comes to this type of installation. Projectors should be calibrated to receive optimal viewing and performance. Aspect ratio is also an important issue. Using the factory aspect ratio preset could deny you from getting the best resolution. Setup is key here as well to ensure your projector and screen have the best screen size, throw distance (the distance from the projector’s lens to the screen), projector location, cables, sound quality and projector mounting (which can be either be ceiling, shelf, cabinet, etc. ), horizontal centering, vertical onset, etc. etc. etc. Is this something you want to take on yourself? If you’re looking for flat panel T.V. or projection screen installation services, be sure to call Mimi’s Audio & Video in San Antonio. Whether it’s an installation for your home or business, we’re here to help with our knowledgeable and professional Installation Consultants. Want to learn more about our flat panel or projector installation services? Then choose from the links below. For flat panel screen installation services, click here. For home or business projector and screen installation services, , click here. Or, simply call us at 210-289-4432 or send us an email at info@mimisaudiovideo.com. We can also provide you a FREE online quote at https://sanantonioaudiovideo.com/contact/.